The Science Rant: Summer Undergraduate Program in Eye Research: paying forward. Summer Undergraduate Program in Eye Research: paying forward. Here is our current crop of SUPER students in the Eye Research Institute. SUPER stands for Summer Undergraduate Program in Eye Research. We have eight newbies this summer, and as you can see they pretty much reflect the nature of our community and the trends in higher education. As we headed into the new century, we already knew that over 50% of science degrees were now being awarded to women. More and more professors in the sciences are also women, more than any time in our past and thus more role models exist to pave the way for our daughters who desire to be scientists and physicians. At this time, it is also not unusual that most graduating medical school students are now women. It is clear from our records of SUPER applications over the last decade that the women applying are more likely to have higher GPAs and thus do well in our initial selection of applicants for interviews. Our students are also from a variety of ethnic backgrounds, reflecting who we are in North America and Michigan. We complete our applicant selection very early and get to make offers to the best OU students and often have them accept. With an excellent track record for our SUPER alumni getting into medical and graduate schools, our program tends attract many applications. I have had the privilege of being the coordinator of our SUPER program for almost a decade now. We start early, making our application documents and forms available in November, and applicants must keep a minimal GPA in sciences and an overall GPA in their college level classes. Applicants have to write us a one page personal statement, and find one Oakland University Faculty member or Instructor to give them a letter of recommendation. The actual previous experience, or lack of experience, at the lab bench is not a large factor, since most undergraduates still need to get those training opportunities. Some students are juniors (3rd year) and some just completed their freshman year (1st year). In the end some get interviewed by a group of ERI Faculty, and then may get a 2nd interview with a specific Faculty member. If a suitable match can be made for both the student and Faculty, then students are formally enrolled our SUPER program. In other words, it is sort of like going for a read job and learning from the start how to apply, how to sell yourself, and how to interview well. We then give these "kids" a scholarship of $3500 for the summer, as they are doing real work as research assistants, not just research trainees. They have to pay tuition like everyone else too, although a few of these students may be at OU on full scholarships because of their excellent efforts from high school. (Left to right) Noor Tarabishy, Paul Zlojutro, Engy Alwashah, Camryn DeLooff, Mindy Cao , Mark English, Mirna Awrow, Melanie Gary. 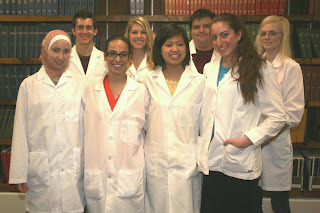 My first SUPER program students (2002) have continued on to graduate schools in cancer biology and genetic counseling. Others are completing or have completed PhD, MD and DO degrees at the University of Michigan, Washington University and the Michigan College of Optometry. Two of my own former SUPER students have proceeded on full-ride scholarships to medical schools at Wayne State and the University of Michigan. Of about 8 OU students in the new Oakland University William Beaumont School of Medicine, most are former ERI research students. One other student just matched to start his residency in Ophthalmology, starting in the 2014 national class. We take these newbies and run them through hours of compliance and safety straining, required for all OU research staff/students, additional training for biological hazards, animal research (mice and rats), and sometimes human subjects research. In just another few years, many of these younger persons will be in medical school or graduate school. These students are not just washing the glassware in our labs. They are growing human cells in tissue culture, doing micro-dissection of retinas from tiny mouse eyes, measuring changes to the expression of neutrotrophic factors in retinas caused by drug side effects, using advanced digital microscopy, running Electroretinagram testing on models of retinopathy of prematurity (ROP), and much much more. Students from our labs at Oakland University end up with lab research skills as good as some experienced graduate students. They do just fine. They get offers from several graduate or medical schools, and some work immediately as senior lab techs, setting up new research labs as they prepare to apply to medical school. The only problem with the SUPER program and others like it, is that we do not have enough funding to give even more undergraduate students this kind of summer research training. Fortunately, through our own ERI Faculty volunteering as mentors, and support from our Provost's office and support from donors such as Mr Skipper (Texas), we have a record high number of 8 SUPER program students this year. If we are lucky, as we get older and need a good doctor's help ourselves, one of these smart young people may be there for you and I. This is how science works. PhD's, like my colleagues and I, were all mentored by several people in our past training, and we can never pay them back. Thus, we all understand that we make our own mentors happy by mentoring young scientists ourselves. Paying Forward. As these young 2013 students progress, they will one day teach others, and continue paying forward. When that happens, I will know that I was a good Professor, when my students become mentors. Not paying me back in any way, but continuing to pass on knowledge and curiosity.